In the last post about it I talked about how I changed the name of the game from “It Always Ends In Nuclear War” to “It Usually Ends In Nuclear War”. The name was meant to be a commentary on human civilization, but I decided to change it as I was afraid that the old name could have given the wrong impression about the gameplay. I also talked about how I changed the graphics, opting to get rid of the pronounced psuedo-3d height visual effect going on. I liked the way it looked and I put a fair amount of work into it, but it was purely aesthetic and it prevented me from using tile colors to display information about a given tile. I want to go more into why I did that and how it works, because it’s actually a pretty huge and beneficial change. In most if not all other similar 4X games there are a set number of distinct tile types. In Civilization II for example, a tile could either be grassland, swamp, forest, plains, desert, or tundra. Each tile type had a specific food, production, and science output. I want the output of a tile to be somewhat dynamic, and I want the player to more or less be able to tell the output of a tile by its color alone. So I still have a base set of tile types which have a specific food and production output, but the tiles are blended in with their neighbors, and the outputs are averaged together (as is their color). On top of this, I’m also further applying a bonus to production or food to select tiles, and I’m using the the shade of a tile color to communicate this to the player. 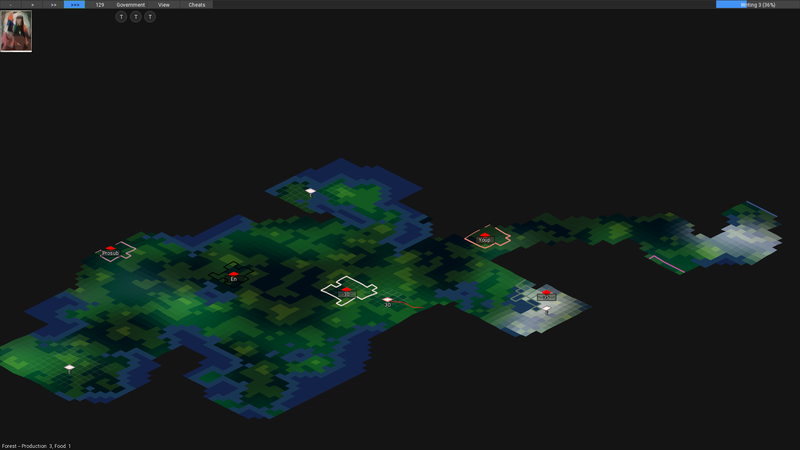 Darker tiles are better for production, lighter tiles are better for food. I can’t say how anyone else will receive it, but I really quite like how it turned out. At least in my head, lighter green tiles look more like grassland tiles and accordingly have great food output, and darker green tiles look to me more like forests and have great production output. 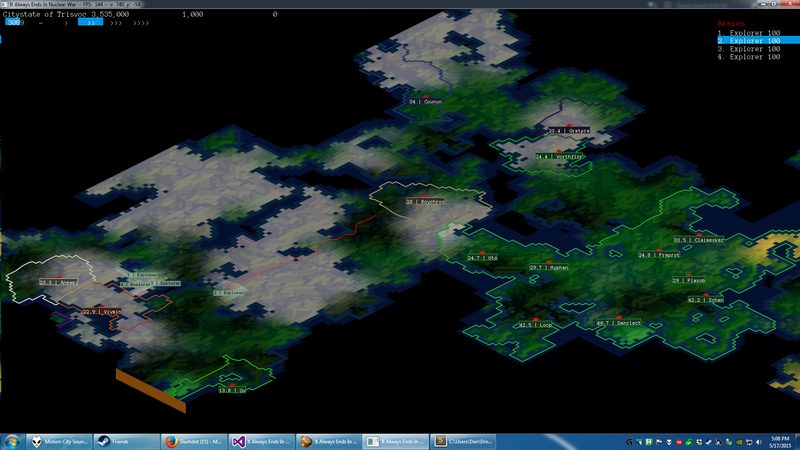 The reason I’m happy about this is that most maps will have huge swaths of land which are a single tile type. In the old system these tiles would all have the same output and I honestly don’t know how I would go about balancing that. This new system allows me to have those large swaths of land which are the same tile type, but vary their output depending on the shade, which for example would make some tiles in a huge swath of desert still desirable. I’ve done a lot of other stuff since then, but those two are I think the biggest and most obvious changes.